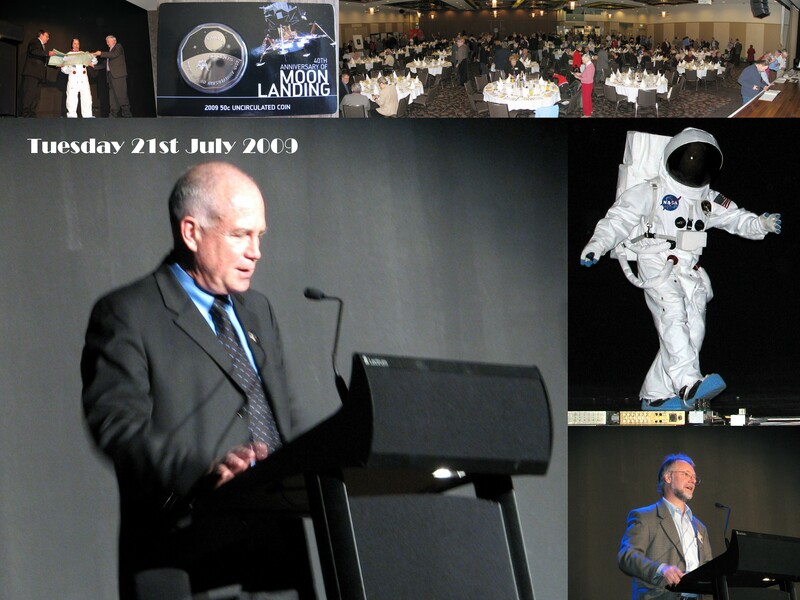 "On the 21st July 2009 it will be exactly 40 years since Neil Armstrong first stepped onto the moon – a defining moment in 20th century history. Many people do not realise that the first pictures from the lunar surface (the most requested news clip of all time) were sent to the world from the ACT. So it follows that the event was one of the major events in the history of the ACT and Australia. There were probably 4-500 people actively involved in that historic event around Australia including 200 or more in the ACT. We have held reunions and celebrations every 5 years or so and will be holding a 4 day celebration this year. Realistically it will be the last major anniversary that will be attended by many who took part, so we intend to make it a good one! We are lucky in Australia that the first steps occurred at approximately 12:50 pm. 5 years ago we played a brand new DVD of the video (plus several of the operational voice loops) in synchronism with the time of the actual events. We intend to do the same thing (but using even better video) this year. The launch of a new Australian 50c coin by the CEO of the Royal Australian Mint. We will be launching at least one new DVD. Displays of memorabilia from 1969 plus many other activities - there will be a full schedule! The events have already attracted lots of media interest and we expect more at the lunch. Genevieve Jacobs will be presenting the ABC 666 'afternoon show' from the venue. The lunch will be held in the Woden Southern Cross Club Corinna Ballroom. The celebrations will start at 11am and will probably start to wind down around 2-3pm. I'm happy to say that Patrick Helian of Questacon fame has kindly agreed to MC the event for us. Bring your memorabilia of those days if you have any. Look at other peoples items. There will be 40th Anniversary memorabilia on sale! Raffles! Door prizes! Due to the generosity of the Southern Cross Club management and the Embassy of the United States the cost per ticket has been kept down to $50, and children under 12 at $25.00. If you are unfamiliar with the club - there will be a sign-in sheet at the reception desk and staff there will direct you to the ballroom."